LED retrofit design to replace MH and HPS lamps up to 250w. 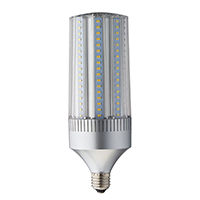 Fully encapsulated, 45 watt LED with E26 or E39 Edison base. Compact size and 360° LED placement allows suitable for fully enclosed post top, shoe box and other typical HID fixtures giving full illumination. UL1598C classification (E39 only) maintains modified fixture’s UL certification.